Imported from Slovakia, Loly is a medium large bodied, substantial and compact female with well developed deep chest, powerful front shoulder and rear quarters. 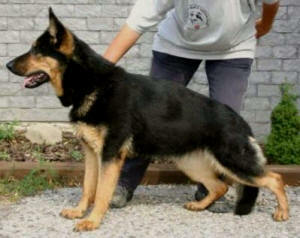 She possess a very nice topline and underline, with a lovely expressive head type & dark eyes. Loly is a BiColor. Lola is a sure and strong female, extremely confident and unflappable in all situations. Showing excellent civil skills, in protection she is serious and highly capable, with her obvious intent being to take down the perpetrator. She conducts herself in a mannerly way in public with steady and sure nerves, showing a great capacity to handle stress. She is a civil and highly dominant female. Lola immediately commands respect and is formidable and fearless when she detects a threat and is one of the toughest , most courageous females we have ever seen. With a superior, well known and most highly sought after working-line pedigree, and carrying the bloodlines of Pohranicní stráze, Lola is the daughter of Ori z Danaru, SVV2. Ori is grandson to outstanding producer Car pod Molinosskou Bannou, V Rated, SVV3, IPO3, SPO3. Yet another great product of the Slovak breeding program, Lola is a super confident and calm worker, and a very independent dog who will easily protect her handler and get the attacker in all situations. Lola is also a grand-daughter of Figa Cega, and daughter of Came z Esagilu. Her mother Came Esagilu is daughter of Grim z Pohranicní stráze (ZVV3, IPO3, SchH3, ZPS1, FH1) Grim z Ps. was one of the most well known producers from the Pohranicni straze kennel, and was awarded Best Czech Defender, Multiple WUSV Competitor, 1997 Czech National Champion and placed 7th in the 1997 WUSV. This proven bloodline goes back on some of the strongest producing DDR blood of Bero v.d. Friedersdorfer Flur, Held v. Ritterberg, and Ingo v. Rudingen. 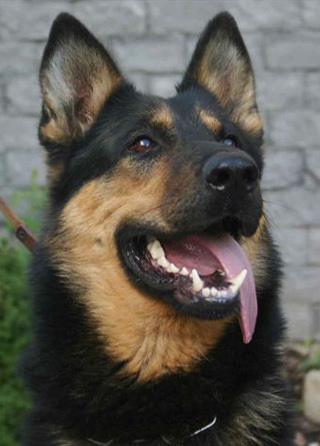 Held and Ingo produced much of the strongest structural health for the German Shepherd gene pool and vastly improved upon pigmentation and working abilities within the German Shepherd Breed as a whole. We are pleased to include Lola into our breeding program and are confident that she will add a strong work ethic and hardness to her puppies along with an outgoing and confident temperament. 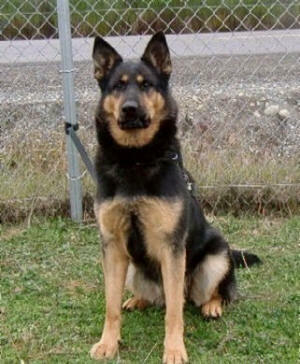 Her pups will be manageable and easily trained, and highly suited for police work, schutzhund, home and personal protection dogs. Lola 's pups are fearless, and we are thrilled to have recently purchased one of the females from Lola's 1st litter, sired by Galant z Pohranicni stráze in Slovakia...Helga z Eurosportu. Lola produces puppies with high focus and drive, with most being placed in strong working homes or police service assignments, and we anticipate the same quality offspring from her daughter Helga.